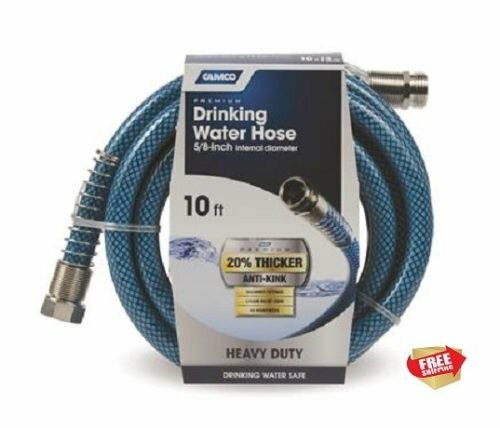 Camco's TastePURE 10' x 1/2"ID Drinking Water Hoses are reinforced for maximum kink resistance. Especially useful when hooked with a Y-valve to your main faucet. Made with NSF certified hose; drinking water safe. Hose is made of PVC and is BPA free. CSA low lead content certified. Complies with California s AB1953 and Vermont Act 193 Low Lead Laws. Camco's TastePURE 50' x 1/2"ID Drinking Water Hoses are reinforced for maximum kink resistance. Especially useful when hooked with a Y-valve to your main faucet. Made with NSF certified hose; drinking water safe. Hose is made of PVC and is BPA free. CSA low lead content certified. Complies with California s AB1953 and Vermont Act 193 Low Lead Laws. 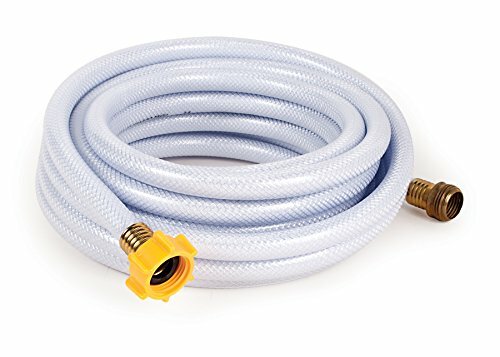 Camco's TastePURE 25' x 1/2"ID Drinking Water Hoses are reinforced for maximum kink resistance. Especially useful when hooked with a Y-valve to your main faucet. Made with NSF certified hose; drinking water safe. Hose is made of PVC and is BPA free. CSA low lead content certified. Complies with California s AB1953 and Vermont Act 193 Low Lead Laws. 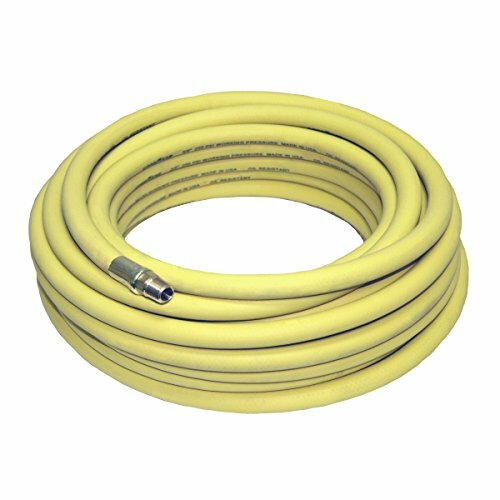 Camco's TastePURE 50' x 5/8"ID Drinking Water Hoses are reinforced for maximum kink resistance. Especially useful when hooked with a Y-valve to your main faucet. Made with NSF certified hose; drinking water safe. 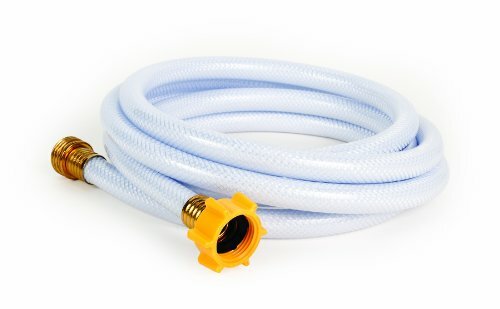 Hose is made of PVC and is BPA and phthalate-free. CSA low lead content certified. Complies with California s AB1953 and Vermont Act 193 Low Lead Laws. Diameter: 3/8 in. Length: 50 ft. Fittings: 1/4 in. NPT (M) Max. Working Pressure: 250 PSI Working Temp. Range: -40 to 190 F This item is no longer manufactured by Michigan Industrial Tools. Camco's TastePURE 75' x 5/8"ID Drinking Water Hoses are reinforced for maximum kink resistance. Especially useful when hooked with a Y-valve to your main faucet. Made with NSF certified hose; drinking water safe. 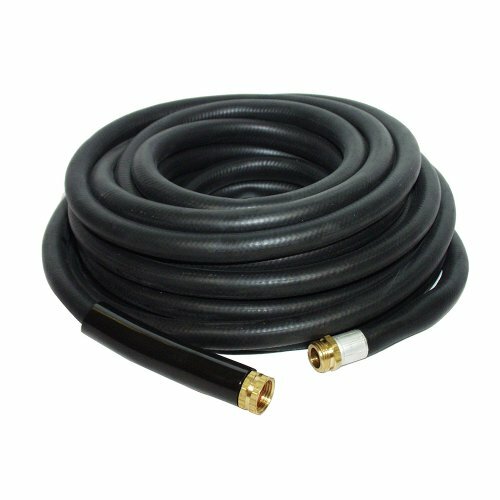 Hose is made of PVC and is BPA free. CSA low lead content certified. Complies with California s AB1953 and Vermont Act 193 Low Lead Laws. Camco's TastePURE 4' x 1/2"ID Drinking Water Hoses are reinforced for maximum kink resistance. Especially useful when hooked with a Y-valve to your main faucet. Made with NSF certified hose; drinking water safe. Hose is made of PVC and is BPA free. CSA low lead content certified. Complies with California s AB1953 and Vermont Act 193 Low Lead Laws. Typically used on RV's and Travel Trailers to connect the Two-Stage Regulator to the permanent gas piping system. 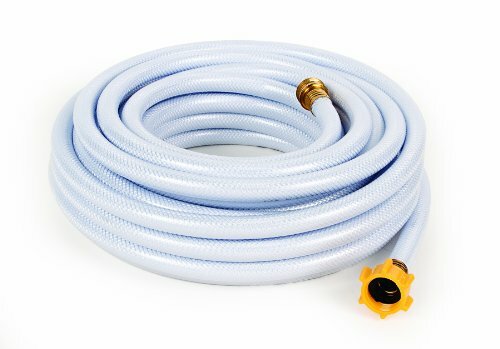 ------Our promise include------ A plain white box with sky blue logo in a simple way A shiny & handy metal hose which you would love to use for lots of pros A black good nozzle. Simple and powerful & 45-Day Money Back Guarantee 12-Month Replacement Warranty 7/24 Online Customer Service Lifetime Technical Support Guarantee ------As a professional, you wanna know more details?------ Thickness of metal pipe: 16 Gauge. Outer diameter: 5/8''. Inner diameter: 3/8''. Recommended working temperature: 32 -176 . Guaranteed water pressure support up to 250 psi. LIGHTWEIGHT BUT STRONG Made of premium quality heavy duty 304 stainless steel. 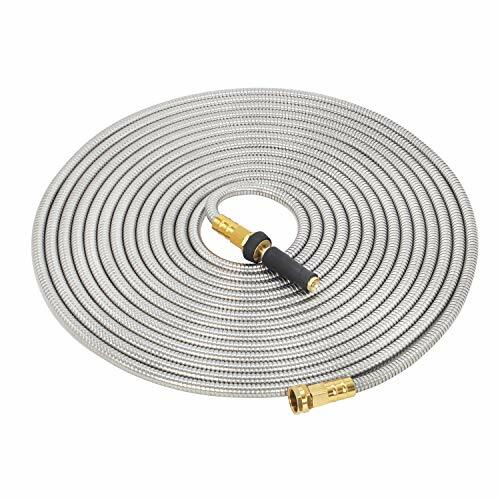 The metal design gives guaranteed flexibility, smooth operation, durability and longer lifespan of the Stainless Steel Metal Garden Hose! Withstanding up to 1000 N pulling force. Guaranteed works at 250 psi water pressure! PREMIUM MATERIAL 304 Stainless Steel Outer Shell - 16 Gauge - 3/8'' ID 5/8'' OD. Corrosion and Rust-Proof! Lead / BPA / Phthalates free Inner Hose, drinking water safe! EXTENDABLE DESIGN Every two can be connected to make it longer as required. Support varying nozzles for multiple purposes. 100% WARRANTY COVERED 45-Day Money Back Guarantee for All items bought from Gwolken's store. 12-Month Replacement Warranty. 7/24 Online Customer Service. Write emails to gwolken@126.com or calling 626-297-1460 for claims. 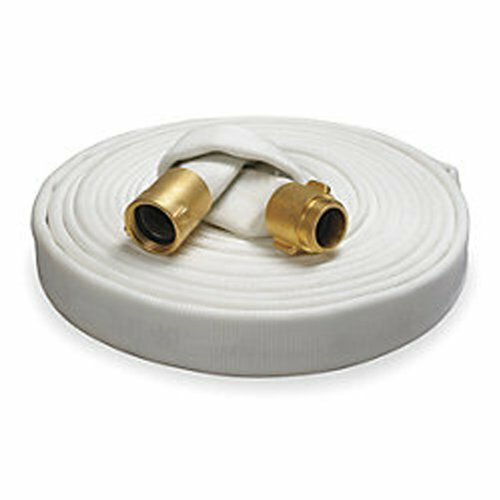 This Key fire hose has a 1-1/2" inside diameter and is 100' in length. It has a polyester cover for resistance to abrasion and flex fatigue with EPDM (ethylene propylene diene monomer) reinforcement for resistance to weathering, ozone, UV, electricity, oils, water, steam and some solvents. It has a 1-1/2" National Standard Thread (NST) female coupling on one end and a 1-1/2" NST male on the other end. These fittings are made of brass for corrosion resistance, ductility at high temperatures, and low magnetic permeability. It has a maximum pressure rating of 250 pounds per square inch (psi) and a burst pressure of 500 psi. This hose is suitable for use in firefighting as well as the transport of liquids in the shipping industry, offshore operations, and agricultural applications. Key Fire Hose manufactures hose for firefighting, industrial, military, marine, mining, agricultural, irrigation, and forestry applications. The company, founded in 1988 and headquartered in Dothan, AL, meets National Fire Protection Association (NFPA), Underwriters Laboratories (UL), Mine Safety and Health Administration (MSHA), FM Approvals, Food and Drug Administrations (FDA) standards, and military specification MIL-H-24606. Apache suction and discharge hoses with xtremeflex technology provides a strong, flexible solution for applications that require tight quarters. Its smooth interior resists Material blockage, while the clear PVC wall provides visibility of Material flow. 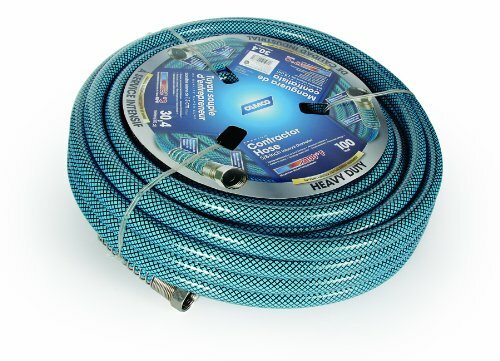 With increased ease of handling and improved storage, this hose is ideal for large volume transfer of water in agricultural, construction, industrial, municipal, and government applications. Complete assembly with male x female aluminum pin Lug Short shank couplings with Brass spinner nut. 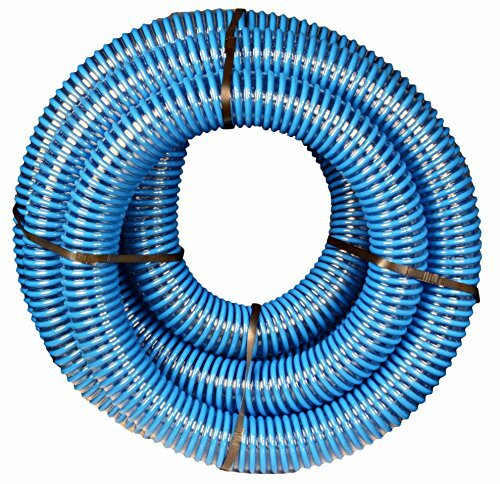 Brand: Apache | Manufacturer: Apache Inc.
Camco's 100' heavy-duty contractor's drinking water hose is a reinforced 5/8" inside diameter hose that is 20 percent thicker than standard hoses. The anti-kink design features machined fittings and strain-relief ends for added durability. The hose is made of drinking water safe material. CSA low lead content certified. Complies with California s AB1953 and Vermont Act 193 Low Lead Laws.